“Promise me you won’t eat anything,” my friend pleads. I stayed silent and mumbled something about having “paid good money for this.” But I admit, I was having second thoughts. Everyone I know had this response when we said we were going on a hike to learn to identify edible wild mushrooms here in Northern California. Everyone seemed to know a friend of a friend (of a friend) of who had died of liver failure after ingesting a pinky-nail size piece of a toxic fungus. The mushroom foraging course I took was sponsored by ForageSF, an organization based in San Francisco whose mission is to “rediscover a forgotten food system and reduce carbon miles while helping to build a local food economy based on a true respect for the skills of our rural neighbors.” I care about this mission and I’ve followed the organization for several years. 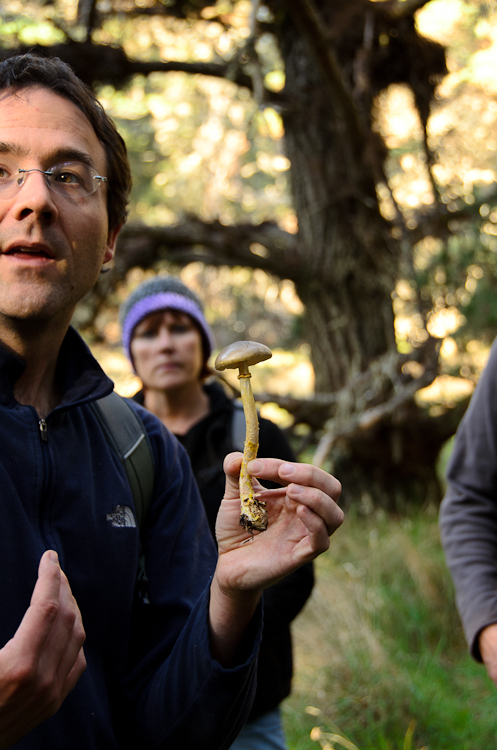 They hold a series of what they call “Wild Food Walks” to teach wild mushroom identification in Northern California forests. Winter is the best time to go mushroom foraging in California because the seasonal rain helps the wild mushroom harvest. I’d found wild mushrooms alluring ever since I was a kid. My grandfather foraged mushrooms in the forests of Western Pennsylvania. I remember finding his mushroom field guides (along with other books on his other odd interests, like taxidermy and antique bottle collecting) in the basement and admiring the strange shapes in the hand drawn illustrations. He also used to grow mushrooms himself on a rotting log he kept in the basement. I never recall actually foraging with him and my interest faded as I became a teenager. 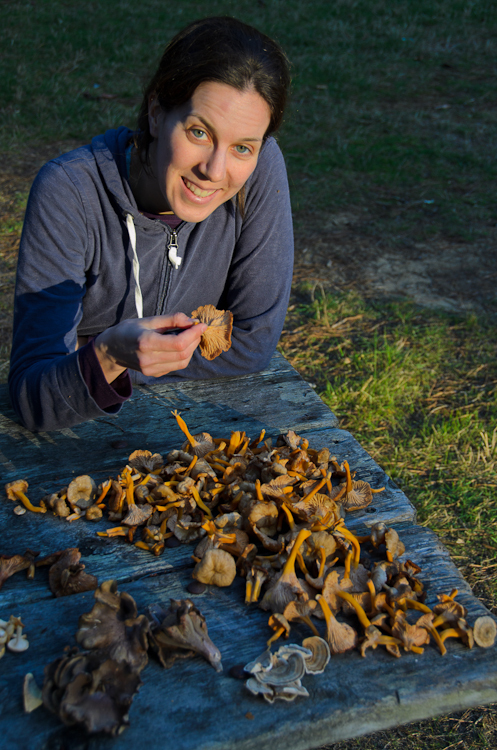 It wasn’t until a few years ago that people started to grow interested in traditional foods and I heard about ForageSF’s edible wild mushroom identification courses that I remembered this experience. The hike took place in a forest in northern Sonoma County. The night before, we spent the night in the Sebastopol (our first–fantastic!–experience renting a room using AirBNB), and drove up that morning for two hours, winding along the beautiful and rugged coast. When we arrived at the designated meeting site (a picnic area in a state park), we were joined by about 10 other students, and our instructor, Kevin Feinstein. During the week, Feinstein is a school garden instructor and naturalist who has been studying wild plants for several years. He started the hike with a lengthy discussion of poisonous mushrooms and the difficulty identifying some deadly mushrooms that even seasoned mushroom hunters can make mistakes (quote: “there are old mushroom hunters, and there are brave mushroom hunters, but there are no old, brave mushroom hunters!”). He assured us that he is extremely conservative in the things he chooses to eat, and will be even more cautious in what he would allow us to take. We learned that most mushroom poisoning deaths in the United States occur among Southeast Asian immigrants from Laos, Cambodia, Thailand and Vietnam. They mistake the deadly but common “Death Cap” for an edible mushroom, nearly identical in appearance, that is commonly found in their home countries. Because the Death Cap does not exist in Southeast Asia, immigrants from that region eat the toxic fungus, unaware of the risk that they face. Feinstein said that you can eliminate the vast majority of potentially dangerous mushrooms by not taking any typical round-topped mushrooms with gills (similar in appearance to the white button mushrooms and portabella varieties we are accustomed to finding in the grocery store). All of the common edible mushrooms we would find look vastly different. There are edible, gilled mushrooms available in the wild, but they are harder for amateurs to differentiate). That all sounded great, but I still wasn’t convinced. By the end of his talk, Kevin and I had sworn off eating any mushrooms at all, deciding we were along for the hike and to learn a few things about the forest ecosystem. It has been an extremely dry winter in California, and mushrooms need moist soil to thrive. 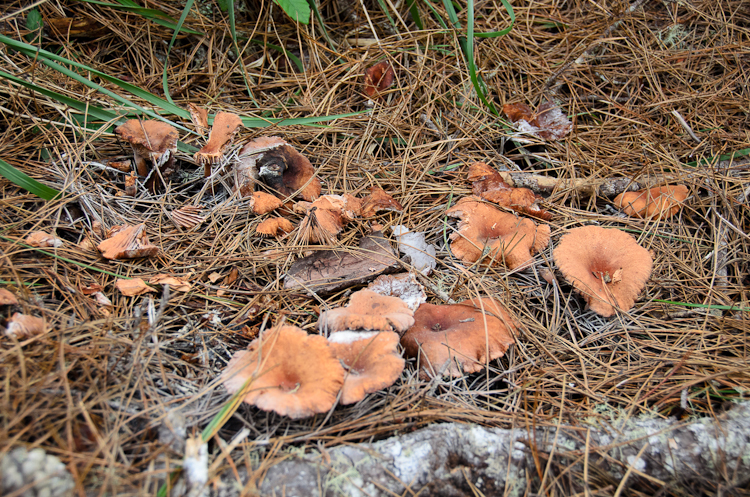 So as we set off on the hike, we initially weren’t finding as many mushrooms as Feinstein says he does most weekends. The occasional mushroom we did find, had gills, and though they were interesting colors and shapes (including vibrant red and even green). I started to think we would go the whole hike without finding anything edible. I was feeling somewhat relieved that this might not be my last day on earth, but also a little let down in missing the danger. As we went deeper into the forest, a fellow student came up to Feinstein with a handful of long, funnel shaped golden fungus. This turned out to be the beautiful and very tasty golden chanterelle mushrooms. As the hike progressed, we began to encounter more and more mushroom diversity, and started to see patches of golden chanterelle mushrooms almost everywhere we went. Who knew such a beautiful thing was so common? We started to get comfortable with the idea of eating these findings when we realized how distinctive they were. There is nothing else in the forest that looks remotely like them. Candy cap mushrooms were our favorite find. They have an earthy, but very sweet smell that smells shockingly like maple syrup! Candy caps are edible and are often used in baked goods. Our instructor told us that Far West Fungi, a wild mushroom shop in San Francisco’s Ferry Building, even sells candy cap ice cream! 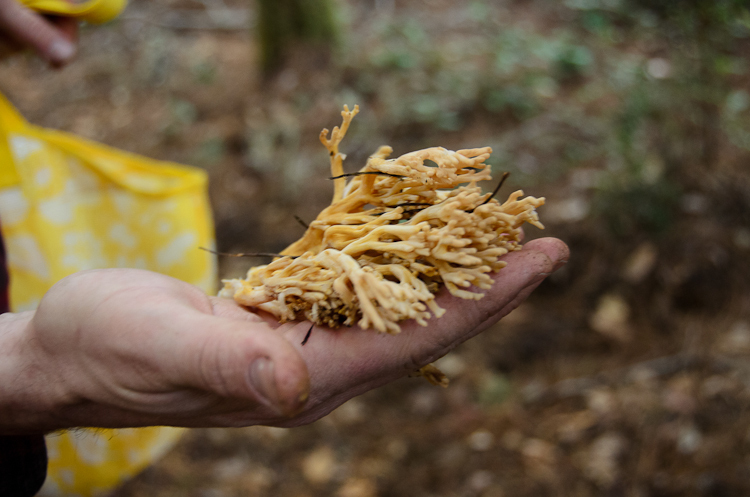 Coral mushrooms are very strange looking. They grow in a giant cluster of branching stems that looked straight out of a coral reef. They are edible, but Kevin told us they sometimes have a strong laxative effect. I decided I’d rather not risk this. 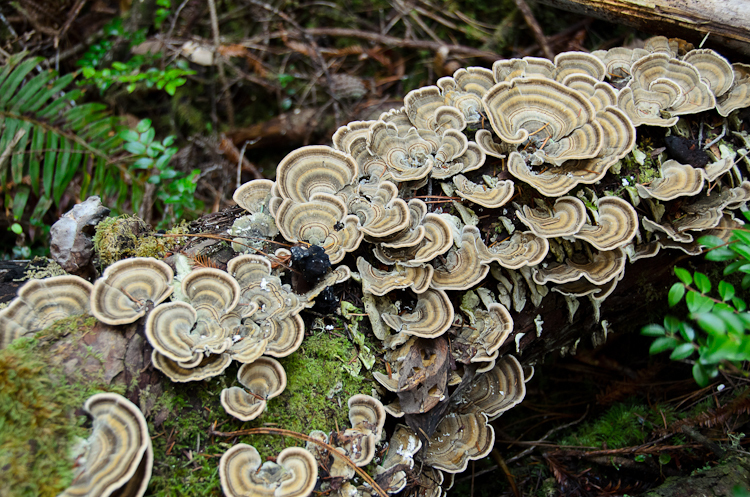 Turkey tails are colorful, leathery disks that grow on tree bark. In traditional Chinese medicine, they are thought to be immune-enhancing and used therapeutically. The fungus is dried and either ingested in powdered form, or a tea is made from the plant. Compounds extracted from turkey tail mushrooms are being studied for use in conventional cancer therapies. 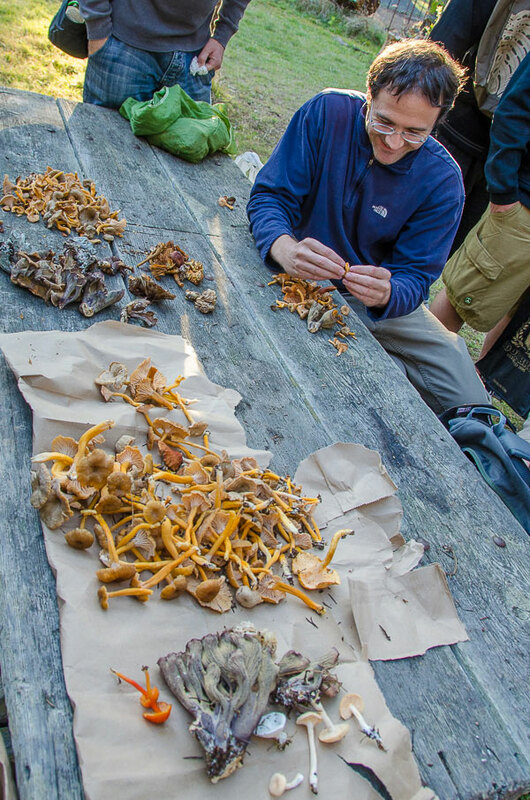 At the end of the wild mushroom identification course, Feinstein sorted through haul to make sure everything we took home was safe to eat and also decent quality. All of ours were identified correctly as being edible, but he threw out some that looked rotten and a little gross. We got a little carried away early on when it looked like we wouldn’t find very much. We took home a good mix of golden chanterelles, pig ear chanterelles, hedgehogs, candy caps and turkey tails. It was enough for us to eat wild mushrooms in every meal for the next week! It was a great learning opportunity and a unique adventure. I feel comfortable now identifying golden chanterelles and candy cap mushrooms, but I’m not sure I’d feel safe finding anything else on a solo mushroom picking trip. ForageSF also does wild morel mushroom identification courses out in the Sierras and I’d love to do that one day. DISCLAIMER: Do NOT use this site to identify edible wild mushrooms in the field. Only eat things that you know to be safe and legal — don’t take my word for it. « Get Big Awards for Doing…What Exactly? how fun! we’ve been wanting to check one of these out, though even after taking a class or whatever, I probably wouldn’t want to forage on my own. I hope you can do it! I’d love to read about it and see your pics. I’ve been wondering how different east coast edible mushrooms are from west coast mushrooms? Enlighten me, brave soul! We’ve got most mushroom from this post in Lithuania but we tend to avoid them all. Mushroom are classified into 4 categories according to their nutritious value. I’m sure that they are edible but very low nutritious value, and probably require a special way to cook. On the other hand, I had been avoiding the false morel until a year ago a friend pointed it out as a gourmet specialty. Yes, the only good ones we found that day were the golden chanterelles and the candy caps (but we didn’t find enough of the candy caps to cook or bake with them). But it was good for our first try! There are no morels in that particular area, but there were in other parts of CA. I’m not sure I’ve ever had them, I’ll have to seek them out. I’m now into healthy food slash Ayurveda and they sat mushrooms are not good to eat because they mainly grow in the dark and don’t do photosynthesis. I’ve wasted more than 20 years of my life foraging for mushrooms! I;m mnot sure about mushrooms not taking sunlight in. Mushrooms store Vit D from the sun like almost no other edible item on earth. How about those Hedgehogs.. ? My favorite.. Nice story. Nice photos. True, thanks for this! They do need some sunlight! Sadly we only found a few hedgehogs, so I didn’t really get to taste them on their own… next time, I hope! I enjoyed the article very much: Found your site while looking for some info on foraging in California areas. But also I thought I should tell you that the chanterelles pictured are winter chanterelles, also known as yellow feet (Craterellus sp. ), rather than the mushroom normally called the golden chanterelle (Cantharellus sp.). Also very tasty, but different. I’m not from your region, so I don’t want to attempt a positive species ID, but the differences between these two chanterelle groups are similarly distinctive here in the PNW. No, that’s fantastic! Thanks for pointing that out! I’m curious to check out some photos to compare, going to do that right now. 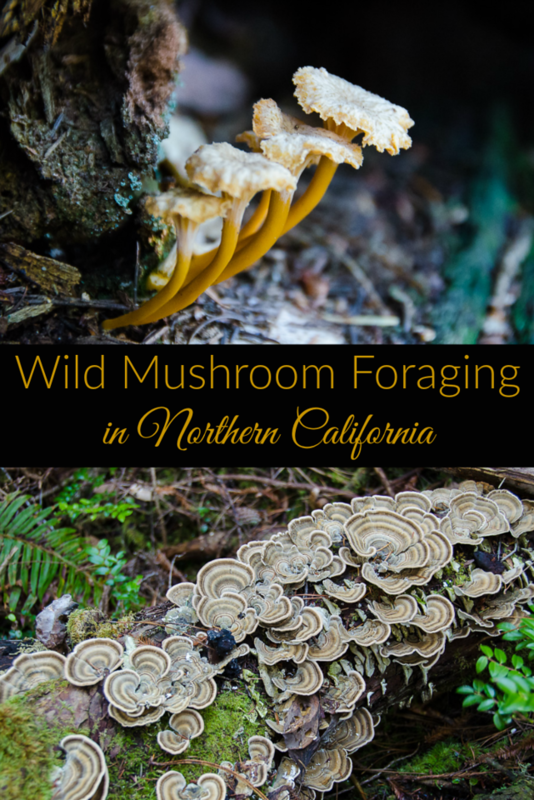 Are you planning a foraging trip in Northern CA? If so where? I’m curious to learn more about where people go and what they are looking for. Thank you so much for reaching out and cheers to you! Glad that you had a great time at Salt Point State Park, one of the few places that anyone can forage for mushrooms openly and legally, up to 5 pounds per person per day, an amount too low for some, and ridiculously high for others! I do have issues with paid commercial classes going there however, since only non-commercial mushroom use is allowed. 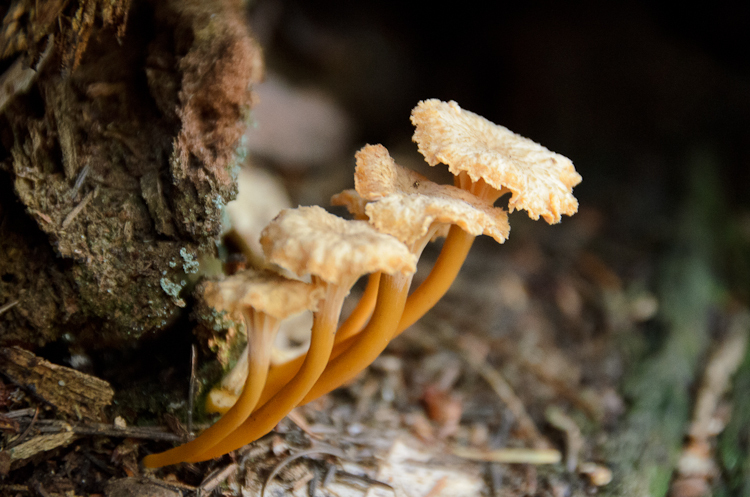 It is odd that your instructor didn’t know the difference between the yellow foot chanterelles (Craterellus tubaeformis) and golden chanterelles (Cantharellus sp.). Yellow feet are hollow stemmed and often grow on well rotted wood as opposed to strictly on the ground. At least two species of golden chanterelle occur at SP: C. formosus and C. roseocanus, as well as a white chanterelle, C. subalbidus. All of these various “chanterelles” occur at SP, but the yellow foot is more common later in the season, at the same time as hedgies and black trumpets (Craterellus cornucopioides). AS to that myth about Asians and Death Caps in NA poisonings … it is just not so. “Death caps, ” i.e. amatoxin containing amanita species with colored caps, occur all over the world, including in Asia, just not Amanita phalloides per se, which is an invasive European transplant to NA itself (and is now, sadly, found at Salt Point, too). All death caps look quite similar, primarily varying in their cap color. Most folks in other countries don’t have to collect their own fungi (unless it is a particular passion or a way to make money), but can easily buy them in markets, which often feature edible amanita mushrooms. All sorts of nationalities get poisoned, not just Asians. And the reasons for getting poisoned are varied; we don’t know why unless we ask the victims! Also, many folks all around the world eat the edible amanitas. They are one of the most popular groups of mushrooms anywhere, except perhaps in the still rather fungiphobic USA. The amanita that you show Feinstein holding in your photo is not known to be toxic. In fact, David Arora, author of our most popular and widely referenced California mushroom books has been feeding that species (now called Amanita augusta) to participants in his field classes for the last several years. That speaks more to the comfort levels and experience of your guide, though. I’m gonna let David test his human guinea pigs for at least a decade before I would feel safe in recommending it. And then probably only with plenty of caveats. But you don’t have to eat mushroom to enjoy them. Keep on having fun with fungus, and check out the many events put out by the various California mushroom clubs, most of them free, and all of them educational. When it comes to obscure topics like mushroom in NA, don’t believe everything you hear! And even more importantly, don’t eat what you don’t know, beyond a shadow of a doubt! Do you have to point out the name of the park for everyone to read? I don’t think I saw it specified in the article and think it should remain unnamed! Hi Jacob! I did purposely leave it out, but it’s not a big secret–it is popular among foragers, and pretty easy to find with a Google search. I did go to the Santa Cruz Fungus Fest last year and have been wanting to join one of their meetups but I haven’t made it back out since I wrote this almost 4 years ago! We are going to a wedding in Jenner this February so I’d love to find a local expert up there to join us for a return trip. Thanks for reaching out, I’ll check out your organization and hope to meet sometime!